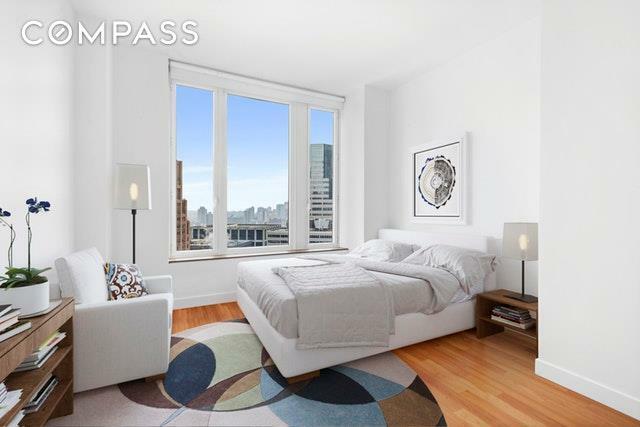 Unit 38E is a well-designed split two bedroom, two bathroom residence measuring 1,300 square feet features spectacular views of downtown New York's iconic architecture and water views of New York Harbor. Brilliant streaming light pours in through the expansive double-glazed windows with southern, and eastern exposures. The flowing Layout begins with an Entry Foyer with walk-in coat closet that opens to a spacious Great Room with a wraparound wall of windows facing to the east and south allowing for gorgeous views and beaming light throughout the day. The open chef's Kitchen boasts custom designed white lacquer and stainless steel cabinetry, Ceaserstone counter and backsplash and Blanco stainless steel sink with Vola satin nickel faucets. 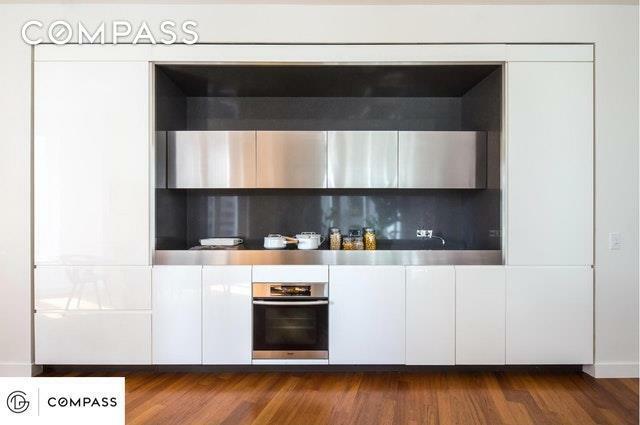 The high-end appliances include fully-integrated Sub Zero 700 series refrigerator/freezer and Miele Incognito dishwasher, as well as Miele gas cook top and convection oven. Additional features include integrated stainless steel hoods, dimmable cabinet lighting, as well as garbage disposal. The spacious Master Bedroom suite offers stunning architectural views, a large walk-in closet and a smaller second closet. 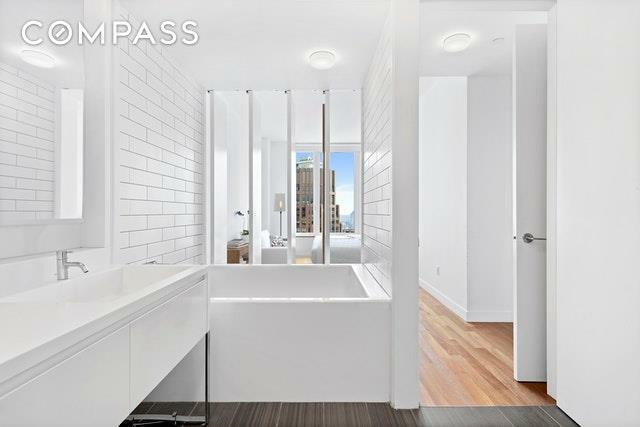 Indulge in the well-appointed Master Bath with exquisitely crafted custom Corian vanity with mirror surround, generous double medicine cabinet with integrated lighting, oversized deep soaking tub, and a separate rain shower and Toto Carolina water closet enclosure. The large Second Bedroom also features stunning southern water views and great light through the same over-sized windows with an adjacent second bathroom. This sleek, contemporary residence features 9'8" ceiling heights, warm Burmese Teak flooring throughout, a built-in home office, Asko washer/dryer, multi-zone climate control system providing heat and AC all year round, high-speed internet, cable television and abundant storage and closet space. Unrivaled amenities include a stunning resident's penthouse lounge with wraparound landscaped terrace, private children's playground, professional screening room, covered dog run, onsite valet parking and Abigail Michael's concierge services. Nearly 18,000 square feet of space is devoted to fitness and exercise including a natural-light filled fitness center with state-of-the-art strength and cardio equipment, indoor 50' heated salt water lap pool, outdoor hot tub, sauna and steam rooms, outdoor half-court basketball, indoor squash court and yoga studio. 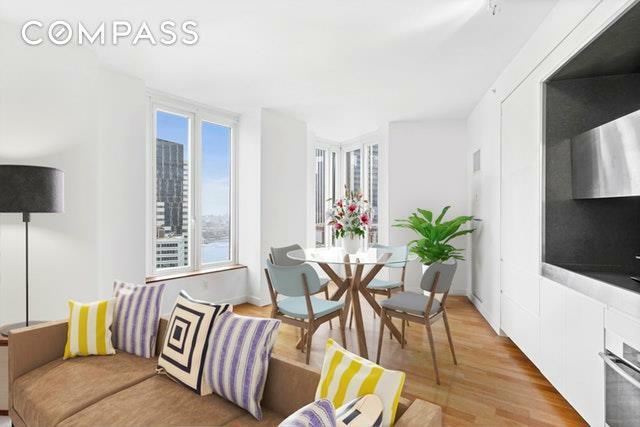 15 William is a modern and sophisticated condominium residence. It is distinctive and contemporary from the outside; modern, warm and inviting on the inside, with lifestyle amenities rivaling New York's finest residential buildings and luxury hotels.Perfectly situated, 15 William Street is a ground-up 320 unit, 47-story luxury high-rise in the heart of the Financial District, Residents also enjoy quick access to many transit options: 2,3,4,5,6,R subways, bus routes, PATH, Citi Bike stations and NY Water Taxi.